However, Action Directe might not have been the first 9a. “Hubble“, in the English Peak District, first sent by Ben Moon in 1990, is also endowed with this mythical grade by some climbers. 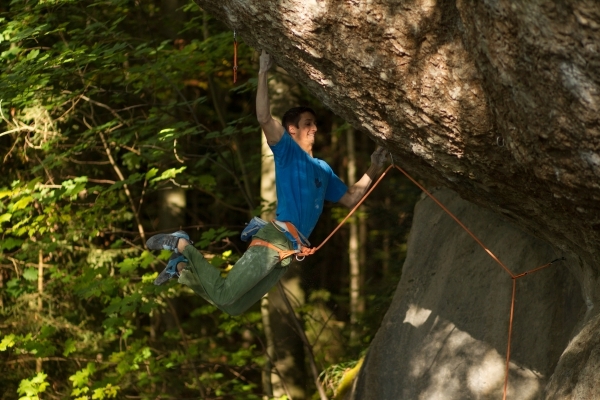 Initially, it was considered the first 8c+ in the world. A few years later, Ben Moon corrected the difficulty to 8c+/9a or 9a. Accordingly, Hubble would be the first 9a in history. Güllich himself could not participate in such discussions. He died in 1992 after a tragical car accident. If he was still alive, who knows to what dimensions Wolfgang Güllich would have taken sport climbing. A climbing idol par excellence for the generation of the 1980s, he still remains a role model up to this day. Bolted by Milan Sykora, Action Directe is about 15 meters long. It runs through a 45 degree overhanging rock formation and – depending on the chosen beta – consists of 13 – 19 moves beginning with a characteristic and famous dyno from a mono into a sharp two finger pocket. During my ascent, I chose a way to ease the mono. I took exactly the same pocket with my left ring finger, but then piled my middle and index finger on it and let them hang down. This way, it felt more like a three finger pocket. The initial dyno into the sharp two finger pocket is followed by a passage with extreme lock-offs on small finger pockets. Then there are technically complicated side holds and pinches with difficult foot changes before you run out with a tricky to hit crimp at the very end, where I still fell several times before sending. The name of the route refers to the French terrorist group “Action directe”. With this name, Güllich symbolically wanted to point to the terror attack of the route on the finger joints. Actually, Wolfgang Güllich was also the pioneer who invented the campus board to train for the special requirements of such routes. He trained his finger power on this special wooden board with small crimps, on which he constantly bounced upwards on single fingertips. Finally, he needed 11 climbing days in the route, spread over three weeks, until – 25 years ago – he managed to send the route in free climbing style. This was not much time compared to how long it takes many top climbers nowadays to perform a project on their personal limit. Therefore, Action Directe certainly would not have been Wolfgang’s most difficult sport climbing legacy, if he would not have died that early. 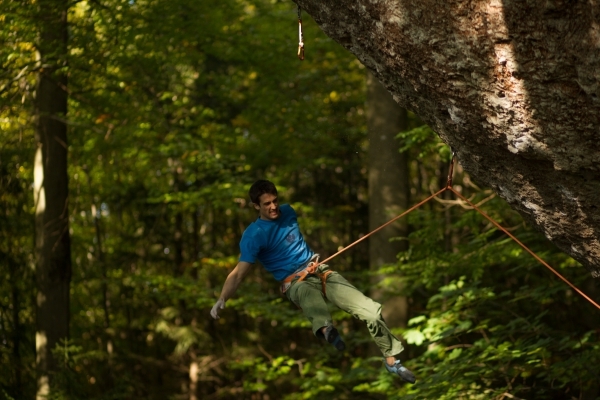 The early repeaters also had to train specifically for the route, because it was “a whole new kind of contactless climbing”, as Alexander Adler stated. The winter before, Alex began with a consistent and very intensive finger and muscle training. He climbed and exercised with a lot of body weight until summer. One month before sending, Alex was more or less constantly on the route, until he could master it after weight reduction. Alex, today living in Dresden where he runs a climbing gym, gave a CD with a TV broadcast about his ascent of Action Directe to my brother Ruben and me when we were about 10 and 12 years old and visiting his climbing gym. Watching this, we were so impressed that we also wanted to climb this legendary route one day. “The second ascent of Action Directe undoubtedly represents a borderline in my life. For me it is the most difficult route I ever climbed. It demanded far more than my repetition of Wall Street or any other similar difficult routes. From the beginning – when I did not try Action Directe yet, but watched the others checking it out – I was thrilled by the sequence of the moves. When I then tried it myself, I went back again and again to just climb one single move even more optimally. In the end, I was engrossed so far by this route that I climbed nothing else, except for some warm-up routes. I was completely focused on the thirteen moves during the last three weeks before the ascent. Almost to the end, I went there with the idea of never being able to climb through. As I rehearsed the route top down to master the run out perfectly in case of getting through, I left the dynamic entry to the end. I knew that this was primarily a matter of maximum coordination. When I then devoted myself to the initial jump one and a half weeks before the ascent, I was at first surprised that I had fewer problems than expected. At this point, I could imagine the possibility of getting through for the first time. But during the next few days the well-known problem began, which many of us know by experience: when the moment of the successful ascent is coming closer and closer, the head blocks out, the psyche strikes. The initial dyno, which I firstly did not regard that difficult, became a “head killer”. Sometimes the jump worked at the first attempt, but then I fell nervously just before the last moves. Another time I made five jumps to grasp at nothing. In spring 2016, ten of the previous repeaters of Action Directe came together in Frankenjura on occasion of the 25th anniversary of Güllich’s first ascent and discussed their experiences. 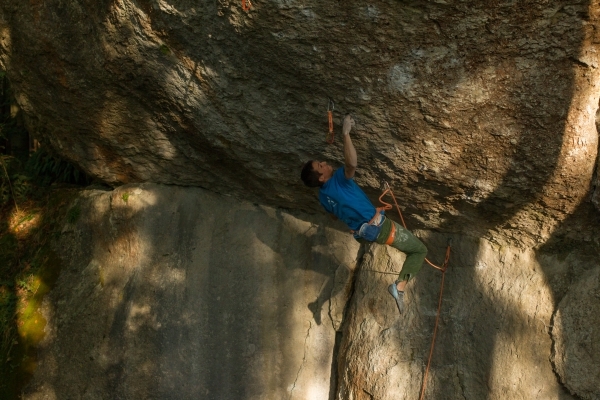 Alex Megos reported that Alex Adler was the only one who had climbed the route in exactly the same moves like Güllich. All others would have used holds to the left or right. 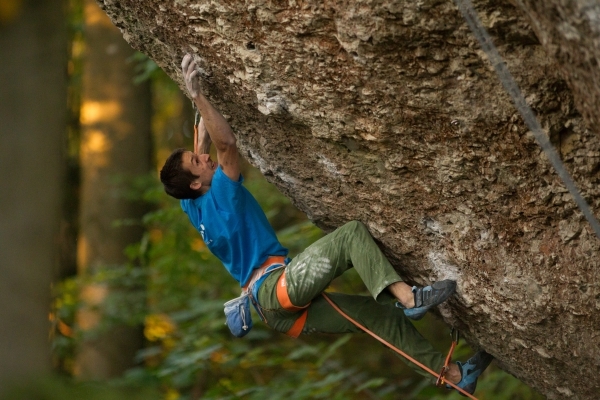 Impressively, Alex Megos himself managed to send the route in May 2014 in just two hours. The route has been climbed 21 times in total now, including my own ascent. One ascent is discussed controversially. During the first 12 years, only three more climbers next to Güllich and Adler managed to repeat the route. From 2005 onwards the frequency increased, possibly because of the generally improved training conditions. Although women have been able to cope with the 9th French grade for several years, none of them yet was able to do Action Directe. It will be exciting to see in the next few years who will be the first. Some have already begun to meet this challenge and to try Action Directe. After my competition season 2016, which went very successfully with semifinal and final results in the World Cups as well as an overall bronze medal at the World Championships in Paris, I was psyched again for hard rock climbing. Action Directe was one of my open projects. Due to my obligations in my studies at the University of Zurich, I was forced to complete a lower volume in the training sessions than I was used to during the competition season before. I took the training easier. I put my focus on short and qualitative training sessions with short boulders on pockets and crimps, longer 20 moves maximum strength endurance boulders, finger and maximum strength as well as explosive power on the finger and campus board. I wanted my finger joints and tendons to get used to the extreme stresses and strains in Action Directe and build up a sufficient muscle tone in my fore arms. Since I committed myself to my studies during week days, I shifted my travels to Frankenjura to the weekends. From Zurich, that is 500 km forth and 500 km back. All in all, I drove almost 4000 km to climb the route. I first tried Action Directe the year before, partly with Julius Westphal, when I spent some time climbing and training in Frankenjura. So I already knew what I would have to go through. Back at the time, my high point in the route was at the last quick draw. I realized that I still had a certain deficit of maximum strength and endurance and I was forced to stop trying it because of the still running competition season. One year later, I came back with a higher maximum strength level. The successful training with my coach, Urs Stöcker in Zurich, played a decisive role in my improvement of climbing this year. I needed the first weekend in the route to get used to the small holds and therewith stress and strains on my fingers. Throughout the whole season I trained and climbed on mostly ergonomically shaped holds and my fingers weren’t really used to pulling hard on monos and two finger pockets which are only rarely set in competition climbing. On that first weekend, I already reached my high point from the previous sessions the year before. I felt optimistic. On the second weekend, I showed a significant progress although I fell three times at the last hard move to the saving hold at the very end of the route. This gave me an extra motivational boost to finally send it the weekend after. However, during the following third weekend, I failed to finish the route. Another four falls on the last hard move left me behind disappointed and frustrated. I also started to doubt if I could still finish the route, because it seemed to be a much too limited time regarding the upcoming cold and wet autumn of Frankenjura. I accessed it bottom-up. Was I about to get the same „head killer” at the top of the route like Alex Adler described it for the first dynamic move during his top-down trials? I wanted to keep pushing through and not give up, coming back a couple of days later, mentally even stronger, relying on myself and not losing hope for an ascent still this year. Arriving, though, there were even more difficulties with the weather. A sudden high above Southern Germany with warm temperatures of almost 20 degrees centigrade and water condensation on the still cold rock led to completely wet conditions in the route. Luckily, not all was lost. I still got another chance a couple of days later when weather and autumn in Frankenjura showed themselves of their friendlier sides with dry and cool conditions. On the first day of the fourth weekend (Saturday, October 29th) I fell once again at the last hard move. Subsequently, in visualizing the route, I tried not to think about every single move, but focused on the changes that I had considered necessary to be able to get through. These were a certain move in the middle of the wall and the exact execution of the last hard move with a modified closure for a crimp with my left hand. This mental attitude – do not think too much, do not make it more complicated than it is, concentrate on the essentials and simply go through, you are able to do it, simply wrap it up and just tick it – was probably the crucial factor for this successful ascent on the second go of that day. During my following go, I did not reflect much, but was attentive and focused. I did not make mistakes while climbing the route. On one hand, I was sufficiently relaxed and on the other hand, also sufficiently tense, determined, accurate and speedy on the way. I breathed deeply several times and finally managed to stick the very last hard move. Frankly, I was a bit surprised and had already seen me hanging in the rope again. It had become way of mental routine and expectation in the sessions before to fall there every time I got up there. Clipping the anchor this time all the way right from the bottom was a great relief and satisfaction. Immediately, an intense feeling of joy and pride came up. Overall, I returned stronger to the route than the year before. I struggled with the weather conditions and had to prove mental endurance, will and perseverance. Through the long road trips and the consecutive time expenditure, I had to accept some shortfalls in my studies, but could reward myself in the end with the ascent. As the route still held me back a little while, taxed my patience and challenged me, the success was even sweeter. I am proud that I managed to make my dream come true of climbing this famous and difficult route ever since I first heard about it and all the stories around Wolfgang Güllich and Alex Adler’s second ascent which I had seen in the old film recording as well as those of other strong and world famous climbers. Today the ascents seem to be faster. On the one hand, a certain mitigation has occurred by different betas with more holds to the right and left of the original line being used. On the other hand, climbers nowadays arrive with a higher level of physical fitness due to improved training possibilities with higher climbing limits up to 9b+. Although, this might reduce a psychological hurdle, as climbers might be more confident to tackle climbs in the 9th French grade, it seems to me that some other psychological challenges still remain the same like the respect for the status of this prestigious route, pressure and expectations as well as “head killers” at the moment right before you get successfully through. I am grateful to Franz Kaiser, a good climbing friend, who is studying in Erlangen, for his hospitality, his time in belaying me and above all his encouragement when the last hard move did not want to work several times. With such a sportive challenge, you simply need such an active support. It is impossible without it. Last but not least, his mobile finger board helped me very much to warm-up my fingers specifically for the route. Without it, perhaps it would not have worked. 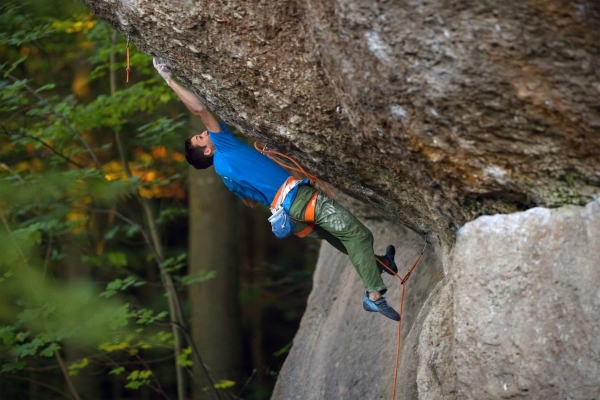 Dieser Eintrag wurde veröffentlicht in Allgemein und verschlagwortet mit 25th anniversary, 9a, action directe, alex megos, alexander adler, ben moon, campus board, climbing, david firnenburg, escaladrome, fight gravity, firnenburg, firnenburgbrothers, frankenjura, franz kaiser, germany, haglöfs, hubble, julius westphal, Klettern, kurt albert, lead, milan sykora, mountain, mountains, outdoor, rock, ruben firnenburg, scarpa, Training, universität zürich, university of zurich, urs stöcker, wolfgang güllich, zurich von admin. Permanenter Link zum Eintrag.